Give the gift of chocolate this holiday season. This festive gift box is filled with 3 oz. 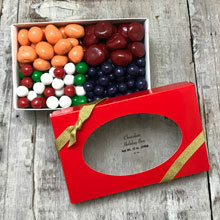 each of Pastel Chocolate Apricots, Pastel Chocolate Cherries, Chocolate Blueberries, and Christmas Holland Mints. Packaged in a 12 oz. gift box.